In the new volume of their Research in Science Education series, editors Dennis W. Sunal and Emmett L. Wright present a comprehensive look at research, theory, and policy related to science standards in K–12 education. The Impact of State and National Standards on K–12 Science Teaching brings together the work of education researchers to investigate the development, status, influence, and future of science standards from a variety of viewpoints. In “History of the Science Standards Movement in the United States,” George DeBoer explores the differences between two interrelated standards movements in the United States, their impact on science education reform efforts, and what remains to be done to promote further progress toward achieving widespread science literacy. Read the DeBoer chapter (Flash, 7.17MB). In “Improving the Alignment of Curriculum and Assessment to National Science Standards,” Luli Stern and Jo Ellen Roseman focus on the continuing efforts of Project 2061 to develop and validate tools for evaluating science curriculum and assessment materials in light of Benchmarks for Science Literacy (American Association for the Advancement of Science, 1993) and the National Science Education Standards (National Research Council, 1996). Read the Stern & Roseman chapter (Flash, 3.66MB). 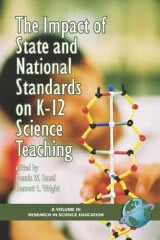 The Impact of State and National Standards on K–12 Science Teaching can be ordered from Information Age Publishing. See ordering information. DeBoer, G. E. (2006). History of the science standards movement in the United States. In D. W. Sunal & E. L. Wright (Series Eds. ), Research in science education: Vol. 2. The impact of state and national standards on K–12 science teaching (pp. 7–49). Greenwich, CT: Information Age Publishing. Stern, L., & Roseman, J. E. (2006). Improving the alignment of curriculum and assessment to national science standards. In D. W. Sunal & E. L. Wright (Series Eds. ), Research in science education: Vol. 2. The impact of state and national standards on K–12 science teaching (pp. 301–324). Greenwich, CT: Information Age Publishing.